31-Jul-2005 -- My employment in Manitoba has often sent me flying by this confluence, but lack of time and a floatplane has always hindered my ability to stop and get it. The Burntwood River doesn’t flow very quickly, but due to rapids upstream, and a fair portage from the nearest road downstream, canoe access is a little problematic. 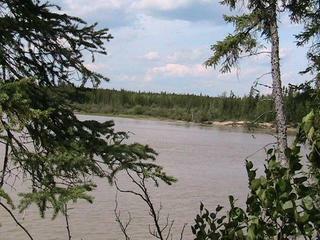 After a visit to 56N 100W, a hike through the forest, followed by a swim across the river just isn’t going to happen! I suppose a snow-machine trip in winter would be possible – a good one-day trip from the nearest town. On July 31, 2005, my luck changed, as I was scheduled to visit several hunting/fishing lodges in the area in a floatplane so that my supervisor for the day could check them out and get to know the various operators. After the last lodge was visited, our route took us back along the river to our home base. I quickly explained the DCP objectives to Curt, and we were on for a visit! A quick but thorough sizing up of the river for its potential as a landing strip revealed no hazards, and so I lined us up into the wind. We slid to a halt next to the small cove that I wanted to beach the airplane in, and slowly inched in to the beach. Once the floats touched the bottom (mud, thankfully) I shut down the engine, and tied the plane up to a tree, so that our ride home wouldn’t float off towards Hudson’s Bay. The GPS showed the confluence to be about 50m into the bush, so we set off towards it. The bush was very thick, and our progress was very slow. After flailing around for about 10 minutes, with the ‘goto’ arrow pointing off in all directions, I thought that we weren’t moving fast enough for the machine to update our position often enough to give us a valid ‘goto.’ Hmm…what to do now? I reverted to raw position data, and pulled out my compass. As the numbers slowly moved towards the zeroes, I followed the compass needle until we came out on the river bank about 50m upstream of where we’d gone into the bush, and realized we were there. Curt’s machine had also zeroed, so we took our pictures, adding a little more knowledge of northern Manitoba to the database, returned to the plane, and departed for home. #2: Overview. The confluence is at the bottom end of the rock beach just above the wingtip.